Today I'm lucky enough to be bringing to you a collaboration with Royal Canin. As a lot of you will already know I have four French Bulldogs - Frank, Miley, Sadie and Lexi. I received a hamper in a 'French Bulldog Treasure' crate which includes two bags of food, a lovely personalised bowl for each of my dogs and some soft squeaky bones for them to play with. My dogs are currently on a diet of dry and wet food, however i am always on the lookout for a new brand of dog food for my dogs to try out and to convert to. I have been giving my dogs Royal Canin French Bulldog* which is a complete dog food of exclusive kibble, specially formulated to meet the needs of the specific French bulldog breed. Royal Canin have a large range with a wide selection of complete diets for many different breeds. As soon as the food hit the bowls my frenchies eagerly tucked in. Each one of them ate their entire bowl and seemed to enjoy the food. In the past some dog foods they have sniffed and not ate and been wary of, however they all was very keen and enjoyed this food. After they finished their meal I gave them the soft squeaky bones to play with. Frank in particular is very competitive and was keen to grab a bone first. 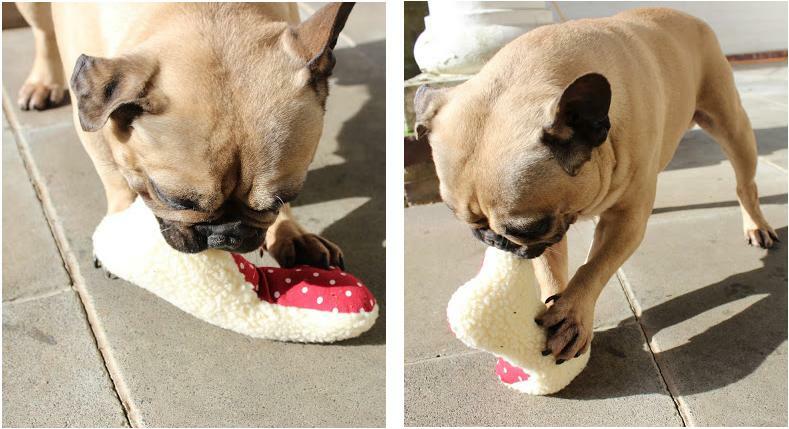 He loved the squeaker in the toy and it give him lots of pleasure playing with it. French Bulldogs make great companions as they are very loyal, affectionate and loving. They get on great with other dogs and all have fabulous comical personalities. They can be quite a stubborn breed and require plenty of training, however are highly intelligent and a pleasure to keep. They enjoy going for walks over the fields, especially when it's muddy as they love rolling in the mud. They love toys and treats, especially pigs ears. This post has been made possible thanks to Royal Canin, but all thoughts are my own.